I really hope everyone remembers their first *good* Bloody Mary like I do. Prior to this revolution, I had only tasted a beverage consisting of purchased tomato "mix" swished around with cheap vodka producing a barely palatable, acidic and flavorless taste. Yet back in 2005 I had a friend who believed in this brunch time hangover cure of a cocktail and insisted on making a believer out of me. She did. The enchantment began by watching the bartender (at the now closed Cafe Montmartre in Madison, WI) muddle horseradish and fresh lemon zest with sugar and pouring in fresh tomato juice with a dash of this and a spritz of that. The final garnish consisted of a few hearty shakes of Tobasco plus the perfect garnishment of pickled asparagus, onions and olives - the spell was cast and I was hooked. She turned to me and said "it's like a salad in a glass that gives you a buzz." The position of being the same catalyst for my token omnivore's first Bloody Mary experience was incredibly rewarding. Strolling around San Francisco, we passed a small cafe with patrons-a-plenty drinking the salty ruby on the patio. He had always shunned the idea because it was a "savory" cocktail and the idea of tomato juice sounded like something that only belonged in a nursing home. When I made a believer out of him, it was one of the most satisfying moments in our relationship. Now it's his favorite drink which is what prompted my interest in this dish. When this recipe for Bloody Mary Tomatoes arrived through an email subscription, I obviously had to make them immediately. 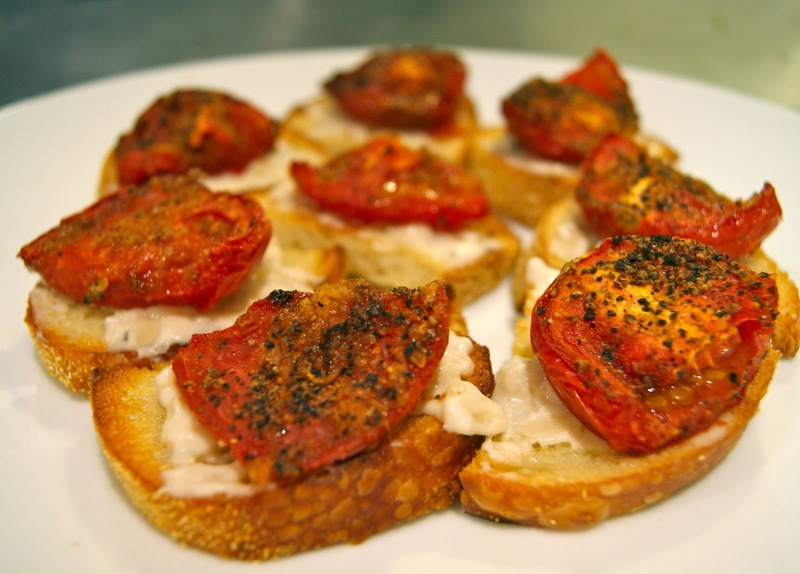 Not for me, but for my special someone who has come to love not only this dear combination of mildly sweet, salty and scrumptious flavors but also the idea of "bruschetta." He now even pronounces it correctly in the true, Italian phonetic fashion. Broo-SKEH-tah. So many firsts have I been able to witness for him, including a trip to Napa that involved us saving money and running to the grocery store to get the ingredients for whipping up our own bruschetta-esque. I took this recipe and ran with in the same way - plopped it on some bread smeared with a creamy spread. I shortened up the recipe a bit to make this a readily prepared appetizer. For the aioli, I used those huge marinated white beans that you see in the olive bar at your natural grocer, but you could easily use white beans with an extra touch of olive oil. Or you could just buy some white bean hummus from Trader Joe's and call it a day. Either way, you won't be disappointed with these tomatoes for which I cannot take credit. Credit-schmedit - they are definitely worth sharing. Preheat oven to 400*F and grease a baking sheet with cooking spray (I highly recommend using aluminum foil over the pan to prevent a mess). In a medium bowl rub the horseradish, lemon zest, celery salt and cayenne into the sugar with your fingers. Add the tomatoes and Worcestershire. Toss to coat tomatoes in mixture and season with salt and pepper. Place tomatoes flesh side up on the baking sheet. Roast for 25-30 minutes or until tender. Remove from heat when done and set aside. Keep oven heated to toast bread. To prepare the aioli: Mash the beans in a small bowl. Add the Veganaise and whip until blended. Stir on the capers and olives, if using. Set aside. To prepare the bruschetta: Slice the baguette or bread into 1/4 inch thick slices. Coat each side with cooking spray and toast in oven to 7-8 minutes or until golden brown. When done, spread each slice with aioli and top with one tomato quarter. Garnish with fresh parsley if desired. Cheers to Bloody Tomatoes and a messy kitchen. 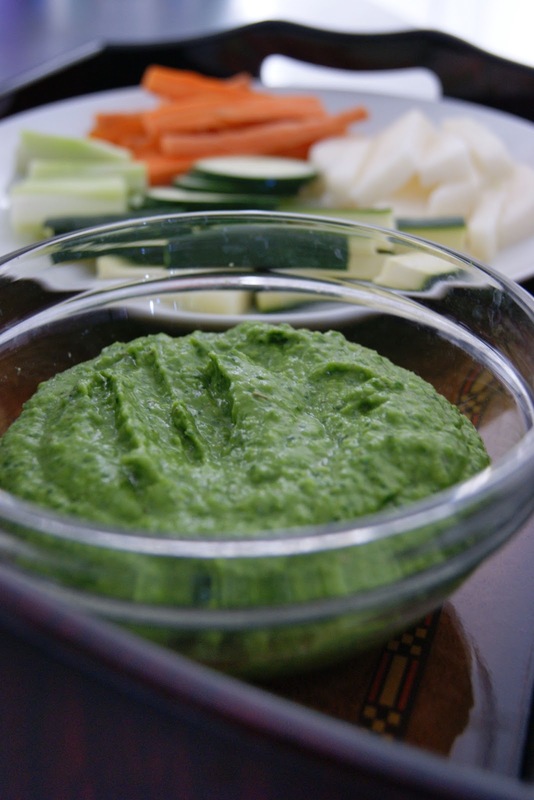 There are a lot of recipes floating around right now for sweet pea guacamole or green pea hummus - both featuring a mush-prone vegetable to put some spring into a dish. Though I don't typically like following blog trends, I do like coming up with quick snacks when I'm low on exciting groceries. In this instance, we were heading poolside and feeling munchy, but I didn't have legumes for hummus or chips for dipping. What I had were crisp vegetables, leafy greens, and frozen peas. Another fantastic result of a clean-out-the-fridge hodgepodge. With frozen peas and edamame always on hand, I had a good base. I'm also going through a juicing phase and have a lot of greens (chard, beet greens, kale and spinach). While we typically juice greens or use them in salads, why not puree them raw? They are tender and breakdown easily, and it's such an easy way to sneak in an extra nutrient punch. Then I started looking for anything green and delicious in the fridge. Thus arose a beautiful and bright concoction. We agreed as taste testers that something is only considered a "concoction" until it has a name. "Green Goddess" is an overused title for a green dressing, green smoothies, or green liquid anything. Yet with my token male out of town this weekend, the last 3 days have been jam packed with lady fun. So we came upon this title to embody our energizing female connections over the past few risings and settings of the moon - 2 of which featured this dip. Cooking note: if you don't have white miso or reduced fat Veganaise (or any kind of Veganaise), this dip will still be delicious. Just add a little more avocado and salt. Combine the first 9 ingredients in a food processor and puree. Slowly pour in broth through the chute until the mixture processes smoothly, without chunking up. Once the mixture is well pureed, add spinach and Veganaise (if using). Process for another 3-4 minutes or until smooth. Serve with slice zucchini, jicama, carrots, radishes, cucumber, or celery. Baking I like. Baking for a cause I like even more. My insanely geologically and hygienically gifted artisan-soap-maker-friend hosted a vegan bake sale to benefit Autism Speaks. While I relied on some classics like Banana Bread and Biscotti which are always get omnivore shout-outs, I wanted to make something gluten free for those who eliminate gluten from their children's diet as means to treat autism. I've dabbled in GF baking before with some wins and some serious failures, but overall my results have been above average. So I figured I'd take a chance, and if it didn't work out, at least I'd get something passable to feed the dog for her morning snack (hopefully). The venture began with a recipe for gluten free scones. 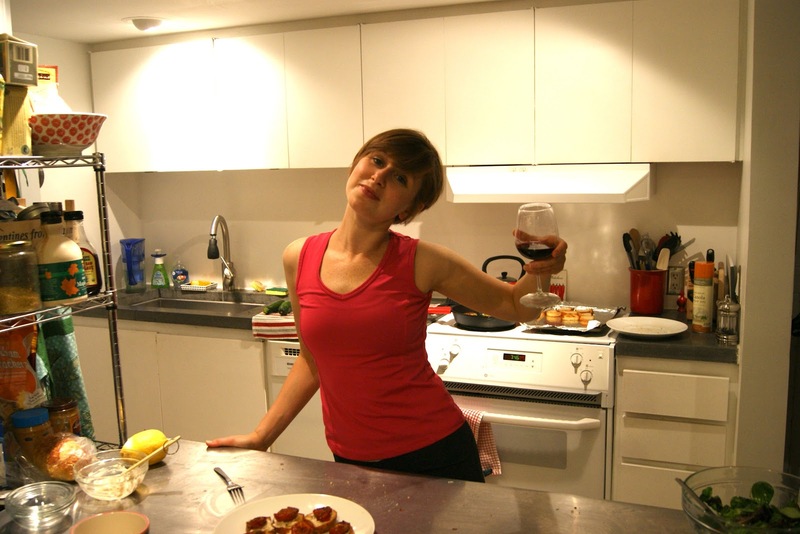 Translating recipes into vegan recipes is one of my greatest pleasures, but there are risks. In this instance, I didn't have cream or even a good vegan equivalent on hand (like soy creamer or coconut cream). So I used "buttermilk" by mixing up some almond milk and cider vinegar. I have made buttermilk scones before, but not with this recipe. Turns out, that thick cream was needed to keep the dough together. When I substituted with something much thinner, I was basically left with a batter. If you've ever made scones, you know that you're supposed to get a dough, something you can work in your hands. This was pourable - crap! I didn't have scones anymore. BUT the batter still held together and had plenty of leavening in it, so I knew it would at least rise in the oven. Scoop by scoop, I dotted my baking sheet with dollops of what I had hoped would turn into fluffy biscuits. Ten minutes later - success! I had fluffy biscuits. Two minutes of cool time and one bite later - double success! I had fluffy and delicious biscuits. Autism sure had something to say about that. Preheat the oven to 425*F. Coat two baking sheet with cooking spray. Combine almond milk and vinegar in a small mixing bowl. Whisk together and set aside. In a medium bowl, mix the next 8 ingredients together. Drop in the Earth Balance one tablespoon at a time and use a pastry cutter or two knives to cut it into the flour. Keep mincing until flour is crumbly and no big pieces of EB remain. Add the almond milk mixture and applesauce into the dry mixture and stir until just incorporated, trying not to work the batter too much. Fold in cherries and zest. Drop about 3 tablespoons of batter at a time on the baking sheets. Bake for 10-12 minutes or until the outer edges start to turn golden brown (don't wait to see a lot of gold here or they won't be fluffy!). Transfer biscuits carefully to cooling racks. When cool enough to handle, EAT. 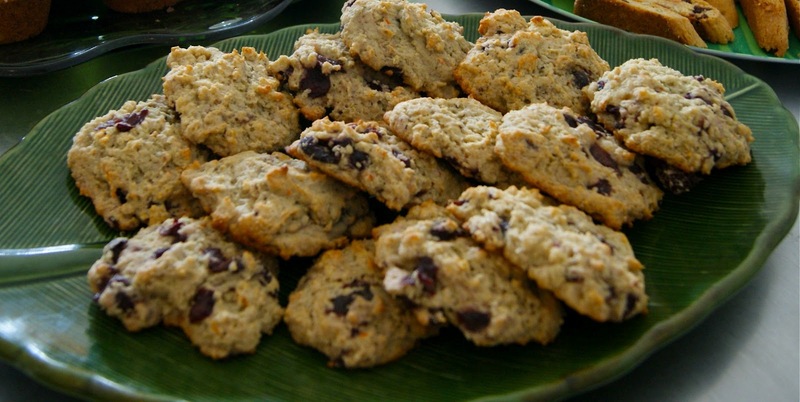 The love affair started with my mother's banana oatmeal cookies - there are no words to describe the addictive qualities of these soft pillows of comforting joy. Anyone that has been around me for a few years know that "banana oatmeal" anything will turn my head and get some mean cravings started. 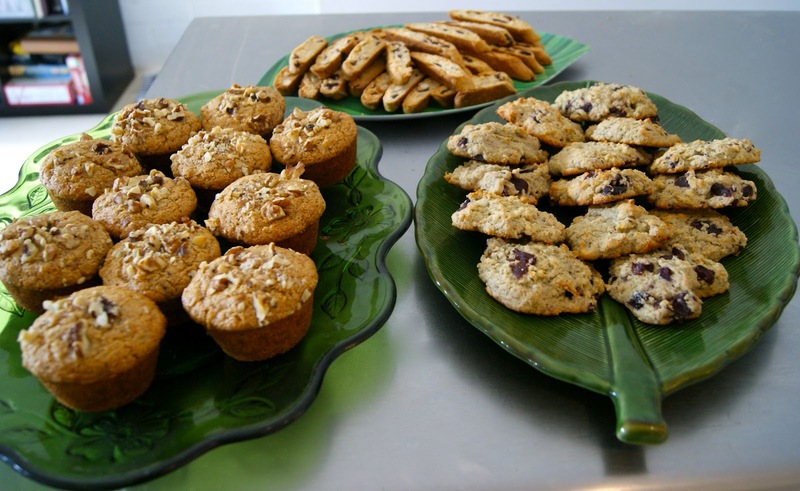 I am known at work for my banana bread muffins and banana oatmeal cookies, constantly receiving requests for them at potlucks and birthday parties. So it was only natural that similar ingredients made their way into a pancake. The means for putting this into action were sparked by seeing another recipe for banana oat pancakes that looked....okay... After reading feedback and reviews, better ideas started forming and in no time these hot cakes were on the griddle. So easy so scrumptious and sooooo much like banana oatmeal cookies flattened out and drizzled with maple syrup! This recipe calls for very little sugar, so using a super ripe banana is critical for these coming out with a balanced level of sweetness. The high-fiber, protein-rich oats give the batter a cookie-ish texture that fluffs up really nicely in the pan despite not spreading like typical pancake batter. As long as you are not too finicky about the shape, and as long as your love banana bread like any sane person, you will fall in love with these. Mix flours, sugar, baking powder and salt together in a medium bowl. Set aside. Mash banana until liquified and add remaining wet ingredients. Whisk until well blended. Add wet ingredients to dry mixture, adding more almond milk as necessary (depending on size and moisture of banana). Be careful not to over mix! Stir in rolled oats (batter will be pretty thick - it's ok). Let batter rest while skillet starts to heat. Heat a large skillet over medium heat and coat with cooking spray - be patient, you don't want to the pan to overheat. When hot, scoop 1/4 cup of batter into pan and smear into sort-of-round shape (batter will be thick, so do your best and don't be too picky about the shape). The pan should fit about 2 cakes. 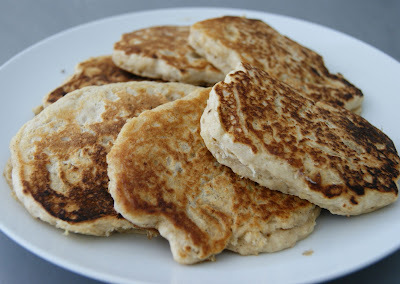 Cook pancakes on each side until just golden brown, about 1-2 minutes per side. Lower heat to just under medium to ensure pancakes crisp on the outside and cook all the way through. 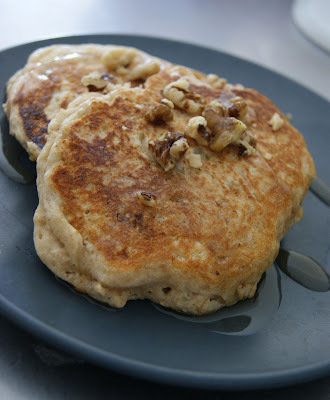 Serve with a scoop of walnuts and small swig of maple syrup. Mmmmmmmm.